We (myself, my wife and one of our sons) stayed in Polifemo, one of the 4 properties here. Contact pre-holiday very efficient and reassuring. Monica met us at the property and explained the facilities, showed us around and gave us tips on where to visit during our stay. The property itself is fairly basic, with no frills, but very clean. We didn't need to pay for the air conditioning as we were there in the first week in October and it wasn't baking hot outside. The large pool is wonderful, with views of Etna and the surrounding hills, and we had it to ourselves during our week there. There was an issue with the wi-fi on one day (the local transmitter had a problem) but Monica leapt into action and the connection was restored quickly. The villa is a good base for exploring the area, and we visited Etna, Taormina, Castelmola, Savoca, and the Alcantara Gorge. Gabriele also recommended the Norman Monastery of Santi Pietro e Paolo, although we got there rather late in the day (our fault) and it was locked, which was a shame . Probably just as well, as we were caught in a massive thunderstorm on the way back and would have been washed away if we had been any later! In summary, very friendly welcome, quiet area, host and manager available and responsive if needed, and good base to enjoy Sicily. Quiet, relaxing place. Worth it ! We have been to 3 different places in Sicily this year, and this is far to be the best. Quiet, relaxing, outstanding people. The place is close less than 20' from outstanding places such as Taormina, Isola Bella, Alcantara. Perfect for a familly ! Monica the house manager is a fantastic woman who will give you advise on places to see and were to eat. She is also very responsive to all your needs! I give this place 4 stars because of the extra charges that are not displayed in the total when you do the search on Home and Away. AC and final cleaning has to be payed in cash upon arrival as stated in the rental agreement once you actually send a request for reservation. Only then you have the real rental price. The area were the house is located is very cosy. The Pool is fantastic and that’s where we were most of the time once at the property. We (myself,husband and one 3 year old) stayed at Polifemo wich had the biggest garden of them all and was also the best house. All the houses are attached in row but with big hedges in between so you are in total privacy. The only thing missing in the house was wine glasses but we bought some at the supermarket. If we come back to this region we will stay here again. many thanks for the review. We had an excellent family holiday staying in Polyphemus. Monica the housekeeper was there to greet us on the morning we arrived, provided all the information on the local area and was really fantastic. We had a small problem with the air con in our bedroom and she got it sorted out straight away, she was really great, friendly and helpful and great to have as a contact if we needed help.We stayed in Polyphemus with our two children aged 9 and 13 for 12 days. a beautiful place, with lovely gardens and a fantastic swimming pool and shaded area, plenty of lovely places to sit and chill out. Lovely accommodation, traditional to the area, a nice shaded terrace to sit and eat family meals if you don’t want to go out. Great having a communal washing machine to use as well. Cleaning provided halfway through the stay with fresh towels and pool towels. We would definitely go back here, it’s a great place to stay with groups of friends or family as 3 other cottages attached as well. Also villa etna is attached to this property which you can rent. Great shaded area to keep your car in as well, beautiful grounds, all well maintained. Guarding Naxos 5-10 minutes drive, Taormina 10-15 minutes. Lovely to stay in this area surrounded by the lemon and and orange groves, with easy access to towns. Highly recommended!!!! Many Thanks for the wonderful review. Please come back soon ! Absolutely lovely rural property with little private garden and big shared pool with diving board (which we had to ourselves a lot of the time). The cottage was very clean and well maintained. And Monica, our meet-and-greeter, was extremely helpful and welcoming. Kitchen equipment (utensils etc) on the sparse side but there is a very useful bbq grill on the patio. Beach at G Naxos is 5-10 mins drive; beautiful Taormina is only 15/20 minutes. Supermarket 5 mins. Only downside is no decent cafes/eateries nearby (Trappittello itself is v unremarkable), but Monica recommmended a really lovely local restaurant in nearby Graniti (Ristorante Flora) - a 15/20 minute drive. A few mosquitoes around in evenings - so pack repellent. 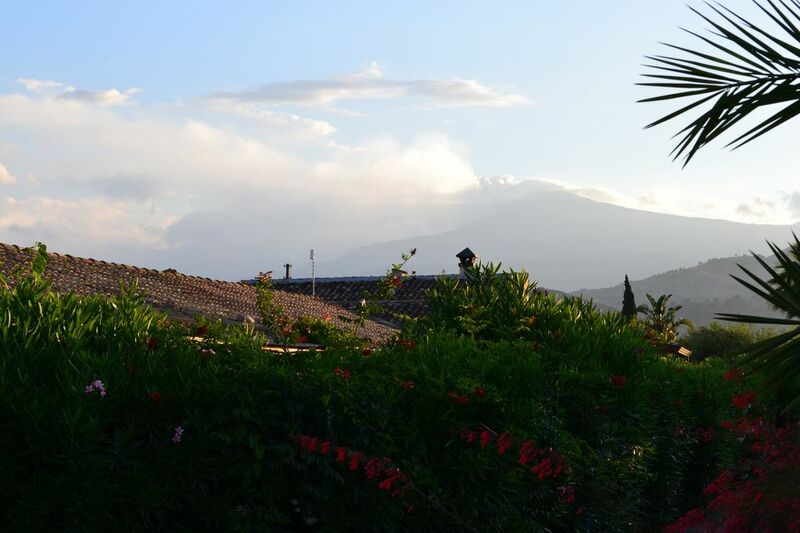 Ah- and amazing views of smoking Etna and nearby hills. We had a perfect family holiday. Many Thanks for your detailed useful review ! Property layout, location and the pool is perfect for anyone with kids looking for playmates in peaceful surroundings. Monica the lady looking after the properties is there no matter what you need. Lovely lady. The only downside is we were staying in the palifemo apartment which was in need of some restoration and we did find the kitchen utensils not very clean. I would stay in luna next time much nicer! Also watch it as after you book the property on home away you then receive an email asking for more money on arrival for air conditioning and cleaning and tax. Came to a lot for just one week. It was a lovely holiday though and we didn't want to leave! Prices can be changed by the owner prior to the booking is done. Pool available from Easter to October. Standard services and taxes included in the price : Vat, weekly full linen and towels (including pool towels), shaded and gated parking area, pool maintainance, wifi, final cleaning, night light in the parking area, 24 h. daily maintainor assistance for any breakage occurring, 24 h. emergency electric generator, check-in and check.out, communal washing machine. Extras to be paid on the spot: air conditioning/heating daily € 17 For other rental conditions, included services, facilities and extras see the Rental agreement or ask to the owner.